The first step in successfully using Adobe Exchange is making sure Adobe Extension Manager can properly install your product. You must upload your product as a single file in order to take advantage of Adobe Exchange to market, distribute or sell your product. As part of defining your product in the Adobe Exchange Producer Portal, you must include the file or file package in order to submit it for approval. You can always package your product in the Adobe ZXP format that Adobe Extension Manager expects. If your product is meant to be compatible with Creative Suite 6 applications, you MUST package it as an Adobe ZXP file. A simple product such as brush or image can be submitted as a single file, or you can submit an executable (EXE or APP). You can create a simple ZIP archive for a set of files and submit the ZIP file. Adobe Extension Manager requires the ZXP format in order to install an extension into an Adobe desktop application; for simpler submissions, the files you submit are automatically converted to this format before being deployed. For CS6 hosts, and for more complex products on CC hosts, you must create an Adobe ZXP package that conforms to the Adobe Exchange requirements. This article explains the terminology and requirements for ZXP packaging. Configuration Manifest: The ZXP format requires a manifest, which is an XML file that specifies all of the configuration details for the product, such as where to install files, which applications are supported, and so on. Depending on how you created your product, the manifest can be an XML file named manifest.xml, or an MXI file. Signing your Package: Adobe Exchange requires that the ZXP be signed and time stamped. This provides consumers a level of assurance; they can trust that the producer and product have been verified by a trusted authority and that the product has not been tampered with. If your product will be distributed free of charge, the ZXP can use a self-signed certificate. There are a various tools available that you can use to package your product as a ZXP, depending on how you have created the product and the complexity of your product. 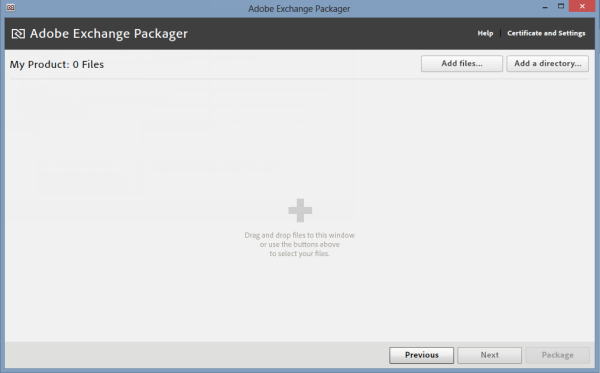 You can download the standalone packager from the Adobe Exchange Portal. See the section Using Adobe Exchange Packager. An online version of the packager utility is available as part of the product-creation workflow. See Using the Online Packager. 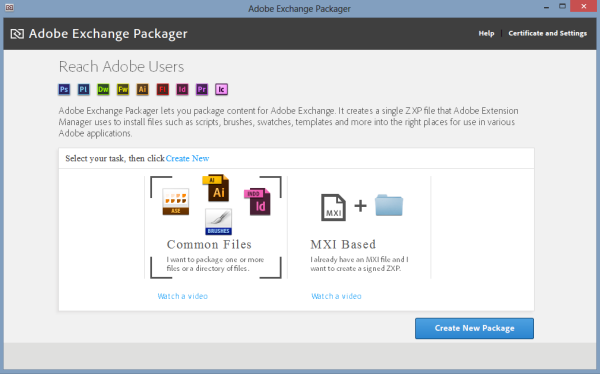 This figure provides an overview of the tools and procedures you can use to create a ZXP package that you can submit to Adobe Exchange, depending on how you have created your product and what kinds of files it contains. 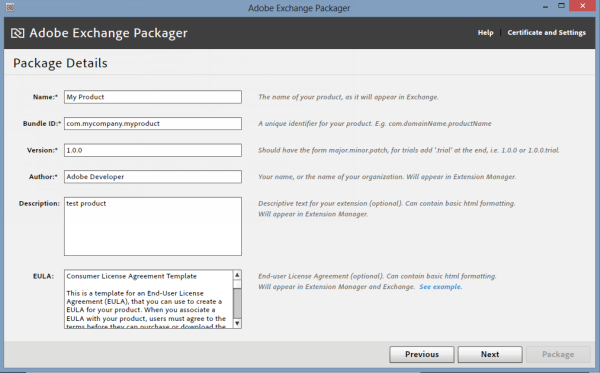 Adobe Exchange has a number of specific requirements for ZXP packages. If the package you produce does not meet these requirements, the Producer Portal does not accept the upload. The ZXP must be signed with either a self-signed or commercial certificate. A commercial certificate is recommended for paid products. The bundle ID of your product must be unique across all the products on Adobe Exchange. In order to ensure uniqueness we recommend that you use the convention “com.mycompany.myproduct” for your bundle ID. The bundle ID value must be alphanumeric, and can contain dot “.” and dash “-”, but no spaces or other special characters. The bundle ID for the trial and paid versions of your product should match. For an Extension Builder product, the bundle ID is specified by the ExtensionBundleId attribute of the ExtensionManifest tag. For an MXI manifest, the bundle ID is specified by the id attribute of the macromedia-extension tag. The product version value must follow the convention of three dot-separated integers, “major.minor.patch”; for example, “1.0.0”. For a trial version of your product, the version value must be of the form “major.minor.patch.trial”; for example, “1.0.0.trial”. If you do not specify a patch number in the first upload, the .0 patch number is appended automatically. Subsequent patches to this product must follow the correct structure. Subsequent patch uploads must have a higher patch number than the latest patch in the system, and currently cannot exceed 99. The product must support CS6 or CC versions of Creative Suite applications. Products that support earlier versions are not accepted. There are two types of code-signing certificate: commercial certificates provided by a trusted certificate authority, and self-signed certificates. Commercial certificates must be purchased from a trusted certificate authority. 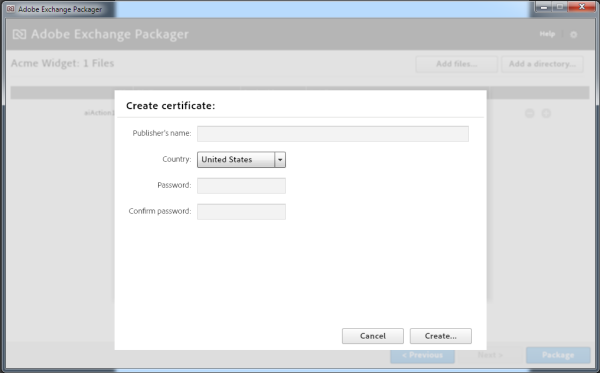 Self-signed certificates can be created free of charge using Configurator 4 or Extension Builder 2, as described above. 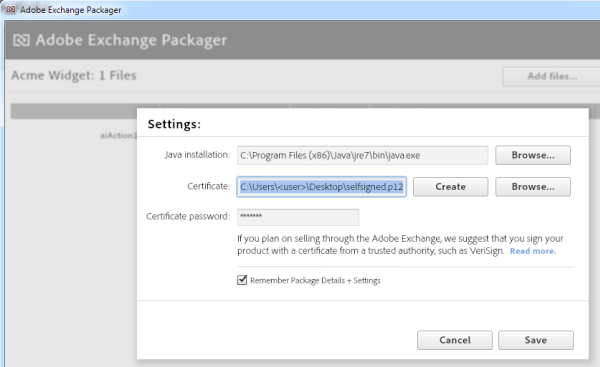 Both types of certificate can be used to sign ZXP files that will be distributed as free products on Adobe Exchange. It is recommended that paid products be signed with a commercial certificate. The p12 certificate file that you provide with your ZXP	package must contain all of the certificates in the certification chain; that is, certificates for the developer, issuer, and root certificate authority. The following vendors can provide a commercial code-signing certificate that is suitable for signing ZXPs to be distributed as Adobe Exchange paid products. Contact one of these vendors directly to purchase a code-signing certificate. Submissions signed with other types of certificate may not be accepted by Adobe Exchange. If you encounter problems using a Comodo-created certificate in Extension Manager, re-export the certificate as a PFX in Internet Expolorer, then rename it to .p12. 1. In the Internet Explorer tools menu, choose Internet options. 2. In the Internet Options dialog, select the Content tab and click Certificates. 3. In the Certificates dialog, locate the signing certificate (probably listed under Personal), select it and click Export. 4. In the wizard, select Yes, export the private key, and when asked to select a format, choose PKCS #12 (.PFX). 5. Check the box “Include all certificates in the certification path if possible”, and then choose a password. 6. Rename the exported PFX file to “p12” in order to use it with the ZXPSignCmd tool (along with your new chosen password). Click Create New Package on the welcome screen to get started. On the next screen, enter your basic package information. The Name, BundleID, Version, and Author are required. You can also add a Description, and an End-User License Agreement (EULA). A EULA template is included below for your convenience. If you chooseto make use of the template, replace the placeholder text in square brackets with appropriate text for your organization. Click Next to add the files that make up your product. You can use the Add files and Add a directory buttons, or drag and drop files or folders from the file system. Click Certificate and Settings to specify Certificate information. If it is installed in the default location, the Java installation location is filled in automatically. If not, browse to the installation location or type in the path. In Mac OS, Java is installed in a hidden folder, typically /usr/bin/java. On this screen, you can uncheck the Remember checkbox if you don’t want Packager to remember your settings by default. You can browse to an existing certificate, or create a new one. Any product that you intend to offer for sale through Adobe Exchange be signed, using a code-signing certificate from a trusted authority. See Obtaining a code-signing certificate. For free products or for testing, you can click Create to create a self-signed certificate. When you have created or specified a certificate, and specified all of the files to be included, click Package. Browse to or enter the path where you want the ZXP file to be saved. The location must be outside the folder that contains your product resources. Test the resulting ZXP file by installing it in the host application using Adobe Extension Manager. If it is all correct, you can use this file as part of your product submission to Adobe Exchange. When you choose “Create a new package (ZXP)”, use the Add files and Add a directory buttons, or drag and drop files or folders from the file system. The acceptable file types and procedure are exactly the same as when you use the standalone tool. To add a Lightroom Plugin package using the Online Packager, you must first zip the package, keeping your package’s internal folder structure intact. For example, “myplugin.lrplugin” becomes “myplugin.lrplugin.zip”. The Online Packager automatically unzips “.lrplugin.zip” files before adding them to the ZXP, providing a seamless installation experience for your users. Check that your certificate password is correct in the settings. Reset your password and try packaging again. Configurator 4 includes a tool for exporting the panels you build as ZXP packages that you can submit to Adobe Exchange. If you have a paid subscription for Adobe Exchange, you can download Configurator 4 from the resources page. When you have designed a panel, choose File > Export Panel as CS Extension. You must have a Java Runtime Engine (JRE) installed in order to create the package. If it is installed in the default location, the Java installation location is filled in automatically. If not, browse to the installation location or type in the path. In Mac OS, Java is installed in a hidden folder, typically /usr/bin/java. Choose a location to write the ZXP package file. The location must be outside the folder that contains your product resources. A CS Extension requires a signed certificate; if you plan to submit it to Adobe Exchange, it must also be time-stamped. If you already have one, you can browse to it and provide the password (less than 32 characters). Otherwise, click Create to a create a new certificate. When you complete all fields and click Export, Configurator creates the package and writes the package file, panel_name.zxp, to your chosen export folder. You can test the package by opening the target application and installing the panel with Extension Manager. Extensions that you create using Extension Builder are based on the CEP infrastructure, and are intended for deployment with the Adobe Extension Manager. Extension Builder 2 includes an Export wizard that makes it easy to build ZXP packages that are compliant with Adobe Exchange. If you have a paid subscription for Adobe Exchange, you can download Extension Builder from the Adobe Exchange resources page. The tool includes extensive documentation and instructions for exporting projects to the ZXP format. When you export your extension with the Export Wizard, it creates a manifest file for you (the file manifest.xml in your project) and creates the ZXP package. If your product supports a range of versions, make sure that the version for the corresponding CS6 or CC product is included. To package content as an extension, you must create the MXI manifest file, save it next to a folder that contains the extension resources, and run the UCF command-line utility. You can package any kind of content, such as new brushes or fonts that you have created or C++ plug-ins that use an application SDK, by creating a manifest (an MXI file) and building the ZXP package with the command-line tool. Adobe Exchange requires that the name of the MXI manifest file match the bundle name for the extension. For example, if your bundle name is com.mycompany.myproduct, the name of the MXI file must be com.mycompany.myproduct.mxi. This match is not case-sensitive. If you try to upload a ZXP package that does not satisfy this constraint, Adobe Exchange reports an error. For a product that supports Illustrator, the MXI must include a Product tag with no name attribute, and with the attribute familyname set to “Illustrator”. For a product that supports Photoshop/Photoshop Extended, the MXI must include a Product tag with no name attribute, and with the attribute familyname set to “Photoshop”. java -jar ucf.jar -package -storetype PKCS12 -keystore myCert.p12 -storepass mypasswd -tsa https://timestamp.geotrust.com/tsa myExtension.zxp -C ./myExtension . https://timestamp.geotrust.com/tsa is the time stamping server you are using. To be accepted by Adobe Exchange, your product’s signature must be time stamped; that is, you must supply the “-tsa” parameter with a valid time-stamp authority. myExtension.zxp is the name of the ZXP file you want to create. You can specify the destination path here; the destination must NOT be in the folder that contains your assets. The dot “.” at the end of the command is required. It enables recursive processing of the folder contents. Save the MXI file into the stage folder, next to the content folder. The MXI file name must match the id tag value in the file. Suppose you want to add a file, such as a readme, to a package that you created using Configurator. Place the signed ZXP created by Configuator and the readme file in a folder together. Create an MXI manifest file that references to both the ZXP and the readme file, and specifies the location where you want them installed. Run the UCF command-line utility to repackage the panel together with the readme file and a code-signing certificate. Suppose you have an existing ZXP file that does not have a time-stamped signature, or an existing MXP package that you want to convert to ZXP. If you have an MXP package, use Extension Manager to convert it to an unsigned ZXP. To sign the unsigned ZXP package, convert the ZXP to a ZIP file by changing the extension. Open the ZIP archive and remove the files “meta-inf” and “mimetype”, if they exist. Create an MXI manifest file that references the ZIP file (or the folder to which you have extracted it) as the package contents. Run the UCF command-line utility to repackage the contents together with a code-signing certificate. It is possible to package up files to be installed by Extension Manager in non-product-specific locations. You might do this, for instance, in order to package profiles or resources to be used by multiple extensions. For the latest complete list of these tokens and their values in Mac OS and Windows, see Path tokens. Extension Manager requires, however, that any package it manages must install at least one file in a product-specific destination. To satisfy this constraint, you can include in your assets a dummy file (that is, an empty file) to be installed in a product-specific location such as $indesign/Scripts. There is something unexpected in the ZXP signature file. Submit a new ZXP with a properly formed signature. The signature section of the ZXP does not have “signatures” as a root element. Submit a new ZXP with a properly formed signature section in the manifest. The signature file of the ZXP does not have a recognizable manifest section. Submit a new ZXP with a properly formed manifest section in the signature file. The submitted ZXP file does not meet the required format. Submit a new ZXP that conforms to the format. The ZXP contains a file in the package that is not referenced in the manifest. Submit a new ZXP that properly references the file. The ZXP references a resource file that cannot be found in the package. Submit a new ZXP that contains the missing resource. There is no digest method for a resource file referenced in the ZXP. Submit a new ZXP that contains a digest method for the file type. There is no digest file for a resourse file referenced in the ZXP. Submit a new ZXP that contains a digest file for the resource. The decoding of a resource file in the ZXP did not match the expected decoding. Submit a new ZXP with a resource that can be decoded properly. I have a ZXP already, how do I get it signed with a timestamped signature? I have an MXP file, How do I convert it to ZXP? I created a ZXP through Extension Manager, but Adobe Exchange complains that it is not signed. I have created a panel with Configurator and have a ZXP, How do I add files, like a read-me? How do I package a .app (Mac OS application) into a ZXP? How do I package my existing C++ plug-in into a ZXP? How can I find out what path tokens are available? How can I install files into a directory without a path token? How can I use Packager to package up stuff that is not product-specific? My commercial certificate is not being accepted, what could the issue be? Can I use an Apple certificate to sign my extension? Is there a way to automate the creation and signing of a ZXP? Using the command-line tool (UCF.jar) creates a temp file in my resulting ZXP. How do I package a Flash-based extension if I didn’t use Extension Builder to create it? Convert the ZXP to a ZIP file by changing the extension. Open the ZIP archive and remove the files “meta-inf” and “mimetype” if they exist. Use the UCF command-line tool to repackage the ZIP archive (or the folder to which it is extracted) with a code-signing certificate. Extension Manager lets you convert a MXP file to a ZXP file. The resulting ZXP is not signed, so to submit it to Adobe Exchange, you must sign the ZXP manually, using the Packaging and Signing Toolkit. Extension Manager does not create a signed ZXP. 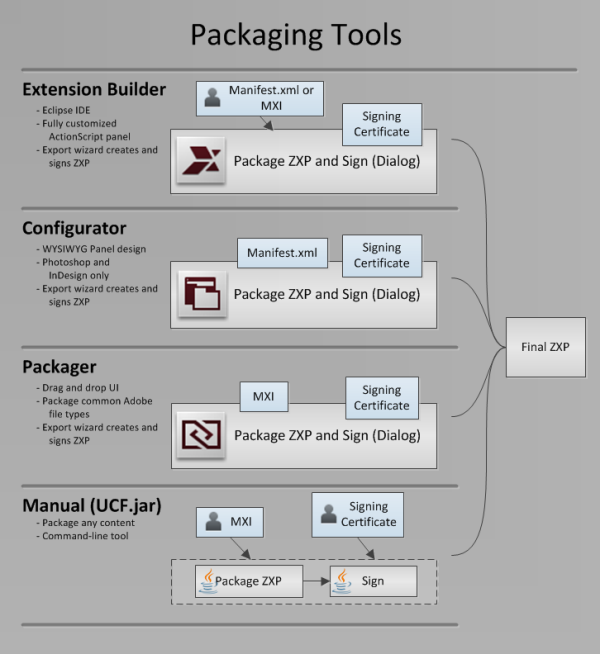 You must sign the ZXP manually, using the Packaging and Signing Toolkit. Can I add a readme file to my Configurator panel ZXP? Unfortunately, Configurator does not let you add additional files to the panel you create. If you have create a fully signed ZXP from Configurator, you can manually unpack it, add the additional file to the MXI manifest file, and rebuild the ZXP. You can use the Packaging and Signing Toolkit to do this; the .app file is the file to be packaged. Create an MXI manifest for the plug-in and use the UCF command-line tool to package and sign it. For the latest complete list of path tokens and their values in Mac OS and Windows, see Path tokens. Extension Manager requires that any package it manages must install at least one file in a product-specific destination. If your content is all installed elsewhere, you can still satisfy this constraint by including in your assets a dummy file (that is, an empty file) to be installed in a product-specific location such as $indesign/Scripts. Adobe Exchange only signs an extension if the p12 file contains all of the certificates in the certification path; that is, developer, issuer, and root certificate authority. When you export a certificate, you must be sure to export the entire certificate chain. Unfortunately not. The p12 file must contain all of the certificates in the certification path. Although you can convert an Apple certificate to a p12 file, it contains only one certificate (because it is marked as “not exportable”). It is possible to automate the creation of your ZXP for upload to Exchange. There are many possible ways to do this; there is no single correct way. As a producer, you must evaluate your situation and use the tools that that work best for you. In general, you would use the Packaging and Signing Toolkit, and some mechanism to run the UCF command from the command line. If you use a centralized repository for your source code, a continuous integration tool like Jenkins might be a good option to run the packaging command. You might also use an Ant script to package the ZXP. Alternatively, you could use Ant to gather your source files to a staging directory, and then run a target script such as the following to package the ZXP. When using the command-line tool, you must make sure the destination location for the created ZXP file is separate from the actual contents you want to package. Create an MXI manifest for it and use the Packaging and Signing Toolkit to package it manually. This is a template for an End-User License Agreement (EULA), that you can use to create a EULA for your product. When you associate a EULA with your product, users must agree to the terms before they can purchase or download the product. 1.1 This agreement is with [Developer Name] (“Developer”), and you agree, that your relationship with Developer will be governed by the laws of the state of [state where Developer is located], United States, as set forth in section 10. This Agreement shall be governed by the laws of the State of [Developer’s State], and the parties hereby irrevocably consent to jurisdiction and venue in the state and federal courts located in [Developer’s State] without regard to any conflicts of laws principles that would require the application of the laws of another jurisdiction. In any action or suit to enforce any right or remedy under this Agreement or to interpret any provision of this Agreement, the prevailing party shall be entitled to recover its costs, including, without limitation, reasonable attorneys’ fees. The United Nations Convention on Contracts for the International Sale of Goods does not apply to this Agreement.